Space seems to have gotten bigger in recent years. Literally - because current theory suggests it's eternally expanding - and, figuratively, as more of the world becomes enamoured with the great beyond. Some of the Internet's most brilliant blogs, along with the 50th anniversary of The Sky at Night, mean that astronomy software - while remaining a bit of a niche market - has an increasingly wide following. Starry Night, now in version 6, has plenty to attract even those with a passing interest in astral and planetary bodies. The Complete Space and Astronomy Pack (CSAP) is the entry-level package in the Starry Night stable, and more expensive editions include the Enthusiast, Pro, AstroPhoto Suite and Pro Plus, which include more extensive star catalogues and refinements, such as computer control of a telescope. The package comprises three separate discs: a DVD called SkyTheater, which contains a series of short movies covering different aspects of the solar system, the Starry Night Companion, a PDF book on CD providing a lot of useful astronomy tuition, and the program itself, Starry Night 6, which is an interactive night-sky viewer. Before you start using Starry Night, you need to select where to view the sky from: there are several places in Britain, like London, Plymouth and Birmingham, or you can pick from hundreds around the globe. You can also pick a panorama, such as a lakeside scene, grasslands with hills in the background or a mountain view, above which the correctly positioned sky is displayed. This is to give you some way of locating into the star field and also so that the positions shown on screen relate directly to what you see in the sky through your backyard telescope. The view you're given is correct not only for your global position, but also from the time of day. This doesn't mean you can only use the program at night, though, because you can run its internal clock forwards or backwards to any point in the past or future, to see how the starscape would look. 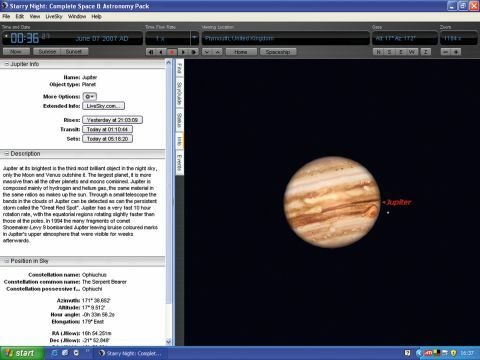 Although you can get plenty of information about virtually any body you point your mouse pointer at, there's lots of extra information about the planets and moons in our own solar system. Each has its own special coverage and the information about the moon, in particular, seems pretty exhaustive. There's special treatment of its history, full 3D rotations of the satellite, footage from one of the Challenger moon landings and details of possible sources of water, which may help in future colonisation. Click on any of the solar system bodies that are viewable in the sky and you can magnify them, which is like a condensed spaceship trip, with the planet zooming into view, like a clip from Star Trek, but scientifically accurate (you mean Star Trek isn't?). Once you get there, the photographically accurate image of the particular planet or moon becomes a map in itself and legends from the mouse pointer say things such as '319km south-west of Romanskaya, crater' (that's Venus). As well as the 'local' planetary bodies, there are millions of stars and thousands of galaxies to look at, and Starry Night helps by identifying constellations and providing plenty of information on each star. This information is updated online each time you start the program, so it should stay up-to-date. There are also plenty of links to other sources of astronomical data. One useful extra we remember from older programs such as Red Shift was the animated tour through the solar system, sliding past each of the major planets. This gave a very strong impression of the relative sizes and distances between them and is something missing from Starry Night, though you can create your own. The program can position you just about anywhere in space, so you can see how the stars will look from there. You can also fly around, using the cursor keys - or a joystick, if you have one connected - and accelerate to several times the speed of light when moving from body to body. It's fun, but not that easy; it takes some skill to warp in from the furthest reaches of the solar system and screech to a near-halt as you rendezvous with a planet or moon. Starry Night 6 CSAP is a great way to encourage an interest in the planets and other celestial bodies. The combination of sound science, using plenty of information from top astronomical sources, like NASA, with a well-animated 3D interface, is compulsive. The difficult thing about reviewing this product is dragging oneself away from space exploration for long enough to stop and write about it.